MEGABOOK! | CE Publishing Group! Supersite! 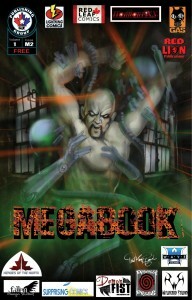 MEGABOOK is the largest free comic book in the Universe! This anthology series features indie publishers and creators from all over the world. 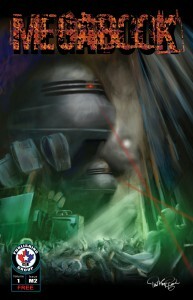 The anthology focuses on providing a limelight for any comic book creators. It’s not a competition over who’s the most talented, it’s about making it possible for great stories to be told. These books are HUGE and completely FREE! Yes FREE! Like most of our books. 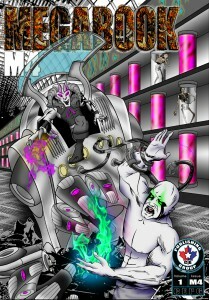 Get MEGABOOK M4 Now at DriveThru Comics! The BIGGEST totally FREE anthology in the internet! 212 PAGES!!! 12 different publishers and tons of creator owned projects. Discover amazing stories and incredible talent all in one humungous book! You NEED MEGABOOK! Your Friends NEED MEGABOOK! Tell everyone you know that MEGABOOK is HERE, and it is FREE!!!! It is HUGE, it’s MASSIVE and it is AWESOME! This is the Biggest FREE Comic book in the Universe! 45 stories and 465 pages long! Amazing comics from 12 different publishers and 101 creators. Everything you could want in one Giant Book! Here is a Ton of amazing adventures from fabulous creators of the indie comics world. If you thought M1 was big, you ain’t seen nothing yet! M1 called his little brother and he’s Massive! Another Massive FREE Comic book anthology in the Universe! 22 stories and 332 pages long! Amazing comics from amazing of creators. The Behemouth anthology continues! Join the legions of MEGAPHILES enjoying the adventures of the indy underworld! CAUTION! Downloading this book will make your digital device HEAVY! Be SAFE and seek out a partner for lifting! And let them read M3 too! Use your legs and not your back! can’t wait till megabook 4! Me too! Planning on having it ready on July 4th! Well done. I like this site. I like how said what MegaBook is I didn’t know it was the largest free comic book. Now you got my attention after you said free. I am really into Magna or something like that Anime comics. I may sound like a nerd but I really like Naruto Shippuden(sorry if I misspelled it) but that is my ish. I really like the show too. It has a good story. 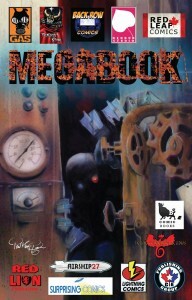 I am going to check out MegaBook now thanks for great site, keep it up. I had no idea that free comic books even existed. When I was a kid me and my bro used to save our allowance just so we could go down to the local convenient store and buy some candy and comic books. I haven’t even thought about buying comic books since I was 9. Thanks for reminding me of a great time in my childhood. I may get a few of these books for my kids. Not a problem at all traveling down comic book lane with you! We live here and enjoy that people can rediscover comic books for FREE..! Thanks for your comments too! We are glad you stopped by! Yeah lots of free comics on our DriveThru, MDC, Emanga and SmashWords comic stands. Hope that you enjoy and share them. Thanks again! We are happy you found MEGABOOK too! Yes, free is pretty cool, and we have allot of that. Hope that you enjoy more of our books like Fuerza 7, Fritesite, Wulfen, The Gifted Path and Co-Op. Pretty cool cover! Thank you for supplying this information. Thanks for taking the time to explain more about MEGABOOK, It was very useful to me. MEGABOOK is a complicated project to understand. We all enjoy publishing it. Be sure to download the new MEGABOOK M4! Hey! This is my first visit to your blog! You have done a extraordinary job! Thanks! We hope that you come back for more great books! Pingback: MEGABOOK M3 on the way! | CE Publishing Group! Supersite! I love comics, and I am overjoyed to find free comics I was unaware of! I will definitely be adding these to my pile of unread books. It’s fantastic that they’re available as e-books, because that makes them so much more portable. I’ll let my hubby know about this as well (he’s always on the lookout for something new to read, comic-wise). Very Cool! Yes, we love comics too! The best part is that we have over 2,000 pages of FREE comic book reading! And our print books are moderately priced. Our M3 & M4 print editions are $12 each. I have print proofs now and am reviewing it for approval. We want our readers to have as much as possible to read from amazing indie creators. We have had literally 100’s of comic creators involved with all of our projects from all over the world. We’re very happy that you’re liking our books! Thanks for commenting and stopping by.